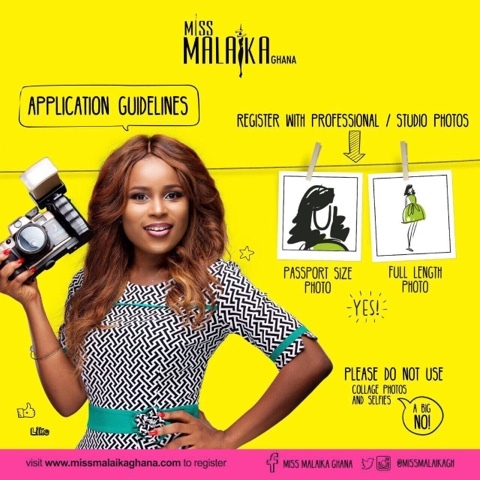 IT’S THE 13TH YEAR OF MISS MALAIKA GHANA AND IT RETURNS WITH A NEW TWIST AS LADIES ALL ACROSS GHANA GEAR UP TO BE PART OF THE AUDITIONS SCHEDULED FOR SATURDAY 30TH JULY 2016 AT THE NAFTI STUDIOS IN ACCRA. For over 13 years, the Miss Malaika Beauty pageant has had many beautiful and intelligent young Ghanaian ladies experience amazing turn around in their lives. The Beautiful and articulate young ladies have changed their lives with Miss Malaika Ghana and won KIA salon cars, over 500, 000.00 GHC cash prizes and International trips to Dubai, South Africa, Egypt and Namibia. The Search is on for the next Miss Malaika Ghana Beauty queen starting off with the grand Audition is slated for Saturday July 30th 2016 at The NAFTI Studios in Accra. Ladies who wish to be auditions are expected to be seated by 7:30am in all readiness for the entire audition process as they meet the astute judges. The 13th edition of Miss Malaika Ghana is produced by Charterhouse with support from CHP live.